Dylann Roof (center), the suspect in the mass shooting that left nine dead in a Charleston, S.C., church in June 2015, appears in court July 18, 2015, in Charleston, S.C.
Dylann Roof, the white supremacist who was convicted of killing nine parishioners in a shooting at a historically black Charleston, S.C., church, did not ask jurors to spare his life or to give him the death penalty while giving a brief opening statement during his sentencing trial, the Associated Press reports. 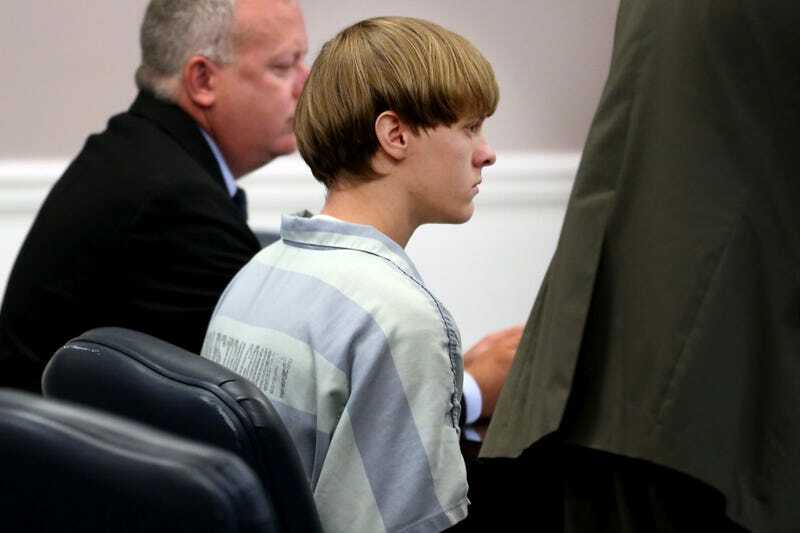 Instead, Roof told jurors Wednesday that there was nothing wrong with him psychologically, adding that his lawyers forced him to go through two competency hearings. Roof ditched his defense team, insisting on representing himself. “The point is that I’m not going to lie to you, not by myself or through somebody else,” Roof said, speaking before the courtroom. The 22-year-old had already stated prior to the hearing that he would give an opening statement, although he has declined to present evidence or witnesses in his defense. Prosecutors, who are seeking the death penalty in the case, had earlier brought forth their own evidence, with prosecutor Nathan S. Williams reading from a journal that Roof wrote sometime in the weeks after his arrest, the New York Times notes. “I couldn’t go another day without doing something,” he wrote in a journal that was seized from his jail cell in August 2015. “I couldn’t live with myself. “I would like to make it crystal clear I do not regret what I did. I am not sorry. I have not shed a tear for the innocent people I killed," he added. In fact, the only regret Roof expressed in his writings was for the pain he would cause his family. “I’m sorry for what I did, but I had to do it,” Roof wrote in a letter to his mother, which was among the documents investigators seized following the massacre at Emanuel African Methodist Episcopal Church. He had also written an online manifesto declaring that black people were "the biggest problem for Americans." As the Times notes, even if Roof is sentenced to death, his case could trigger years of appeals, for which he will not be guaranteed the right of self-representation that he has opted for thus far. Read more at Talking Points Memo and the New York Times.